So I mentioned these doors right? Which, btw, you haven’t seen the half of. Also, you can’t have a boring scene coming through those doors. And it says everything that needs to be said about this guy’s social status and level of taste. Similarly, how much more hilarious is an ankle-kicking scene where the victim has to sit down in front of a wall of flowering bushes? Three times more hilarious. Let’s call them azaleas, because the caption “Taking Refuge on a Curb Among the Azaleas” is even more funny. Of course “location” may, indeed, be someone else’s prerogative, which is the territory we’re straying into here, as is some of the more situational set-up to follow, but they mesh together to create the ambiance of the show. And whoever the storyteller is involved in putting these things together, they’re doing their job. Pardon the screen-cap sloppiness on some of these–my focus on the sets means sometimes there are heads rolling. Okay–this is a prime example. (Of both points X]). 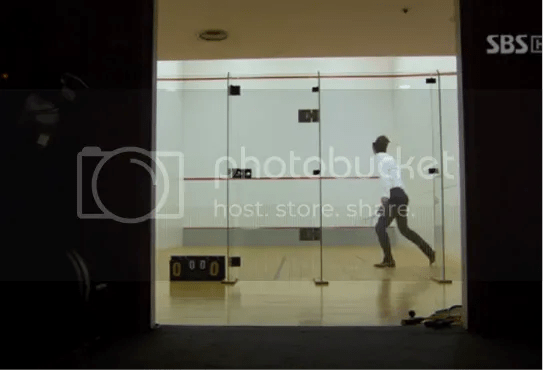 Raquetball as the angst-emotive sport of choice? AWESOME. First of all, it’s much more fun alone than basketball (Sang-hee’s angst-sport). It’s also the kind of upper-class elitist sport that’s just what he’d pick out. From a filming point of view, it makes a very interesting space, and that satisfying thwack resounds of anger. Previously, he showed his snob-taste by drinking something probably quite tasty because it has color like brandy, scotch, wine, RUM (okay, probably not that) with a…plate of fruit. Somehow that looks both super aristocratic and actually fantastic. Again, we have splashes of cobalt, the fruit’s color enhanced by the flower arrangement of white and red in the foreground. Contrast: we have some. Food related ingenuity actually has struck me several times. Sure, we see people eating ramen all the time, but what about this cozy and enviable set-up? See, even more color in this house by daylight! And see that kitchen set up? 1, that bar is awesome; 2, those doors are also worth noting; 3, he’s so boooored without you, Ah-Jung! The ex has practically no chance because she didn’t help him invent Cola-Kissing. I was a bit dubious of these pins on Ki Joon, I’ll readily admit. Little felt bow ties and flowers, as decoration on his lapel? Are we sure he’s not running a Queer Eye boutique, rather than a business-class hotel? But with the advent of these slightly less Play-Skool variants (again, nice plaid [you’ll bear hearing more on that later. Plaid, that is]) I finally understood. But that’s all right. It’s kind of pretty. I also like that he is reusing them, not always in a new one. And it does add a touch of contrast where this character is otherwise not flashy. I mean, talk about an entrance, right? We won’t go into raptures over the double-rows of buttons, or the subliminal texture of the color on that coat…or maybe, we don’t even need to. Okay, but that flower’s just a little too smug. 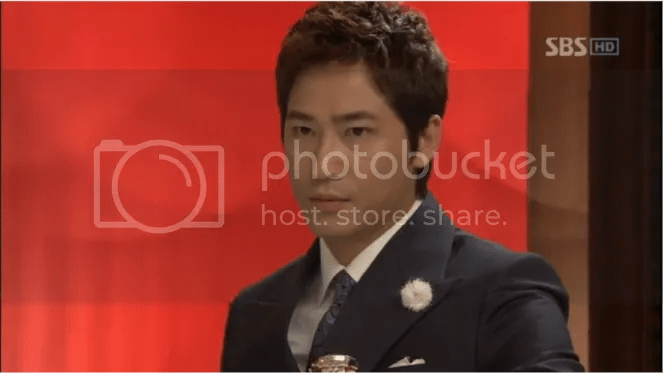 I’ll have to say, that I found Kang Ji-Hwan much more exciting in Coffee House. Even his somewhat split-personality fashion sense built up that picture of someone who can’t ground themselves, and though it was not quite the Suit Ideal, if I went back no doubt I’d find things to wanna steal from his wardrobe. Now I’m screen capping it I’m finding that though the costumes themselves are not that innovative, there are touches to the drama that are artful. Actually, the set-dressing. Did you see that? COLOR. In the arrogant chaebol fashonisto’s house! Stunning, right? We’ll talk about his pins later, but that is a supercute bow. And look! His OFFICE TOO! Color! and cobalt. It would also be cute if he was like my dad and just got into knots over the cobalt blue glass. 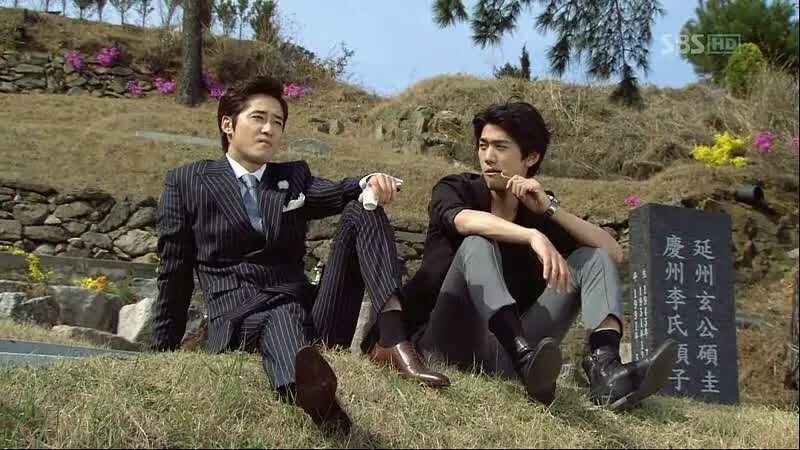 So far the clothes in this drama have been not enough fun to drive me to the print-screen button, but there are some notable exceptions…ah, chaebol businessman characters. Providing suit-fetishists like me with distraction from plot-points time after time. Lamentable hairstyle right here, but yanno…it’s cute in a “I need to talk him out of that style” sort of a way. You are currently browsing the archives for the Lie To Me category.